It's finally here! 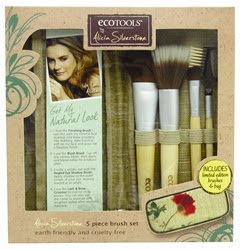 The EcoTools by Alicia Silverstone collection with cosmetic bags and brush sets are available this month (December) at your local Walgreens or online retailers such as Drugstore.com, which is cheaper than at Amazon. There are five different pieces you can choose from. All bags are made with natural hemp material and the lining of the bags are made with recycled plastic. The more I look at them, the more I want to get them!! 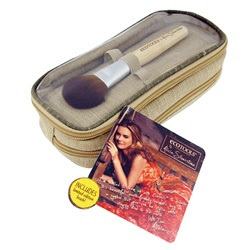 The other three options are cosmetic bags only with a beautiful floral design that is printed with non-toxic inks. In order of price (high to low) and left to right, is the Overnight Bag which is not a duffel bag but just a larger cosmetic bag, the Train case, and a regular cosmetic bag.